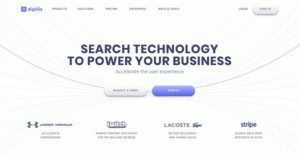 Algolia is a platform for building search that provides solutions to help businesses develop unique search and discovery experiences for customers across different platforms and devices. Algolia decodes every customer sent query, clicked link, or opened app to help businesses deliver the corresponding right content. The software builds frictionless find-to-conversion paths by linking users with exactly what they’re searching for at rapid speeds and with premium accuracy. Development teams are provided with extensive documentation, guides, and other building blocks to create a fast and relevant search experience. Users can go beyond the search box with navigation, browse, and content discovery experiences powered by Algolia. The program also builds predictive and natural interactions to create immersive experiences that present relevant content. Algolia has solutions to integrate content throughout different online properties and build an advanced site search and discover experience. The software also supports mobile search experiences, with infrasctructure, API & UX tools that are designed to optimize searches on different devices. Users can bring search to any platform with pre-build API clients, UI libraries, framework and platform integrations. Algolia e-commerce search and discovery solutions help speed up conversions, boost engagement, and establish customer loyalty. This is with the software’s ability to build personalized and intuitive product search and discovery experiences that online shoppers prefer. Online shopping sites can also capture data into Algolia to offer the right products based on purchase history, preferences, demographics, favorite store and other aspects. The platform also supports query rules illustrations to provide business control with built-in merchandising and business logic. A visual dashboard fine-tunes the products ranking based on their popularity, reviews, profit margins or any pertinent data. Analytics illustrations help businesses understand their customers more by identifying their searches and filters. Algolia fuels media search and discovery to help drive engagemet, increase loyalty, and retain users. The software helps build engaging experiences for end-users by providing the freshest and most relevant content, personalized for each user, and delivered in real-time on users’ chosen device and platform. An Algolia Custom Crawler unlocks archives for users to discover rich content, while boosting relevance based on custom engagement variables such as shares, likes, or even metrics from Google Analytics. Algolia SaaS search and discovery solutions provide safe, reliable and scalable searches intended to drive user retention. Organizations can save time and streamline development cycles with detailed documentation that eliminates the complexity of integrating search into your products. Algolia offers 16 API clients, 9 client libraries, and 5 supported plugins for convenient and extensive search and discovery results. If you are considering Algolia it might also be sensible to examine other subcategories of Best Site Search Solutions collected in our database of SaaS software reviews. Each company has its own characteristics, and may need a specific Site Search Solutions solution that will be fit for their company size, type of clients and employees and even individual industry they deal with. We advise you don't count on getting an ideal services that is going to work for each business no matter what their background is. It may be a good idea to read a few Algolia reviews first and even then you should remember what the software is intended to do for your business and your staff. Do you require an easy and intuitive service with only essential functions? Will you really make use of the complex tools required by experts and big enterprises? Are there any particular features that are especially useful for the industry you work in? If you ask yourself these questions it will be much easier to get a reliable software that will fit your budget. We realize that when you make a decision to buy Site Search Solutions it’s important not only to see how experts evaluate it in their reviews, but also to find out if the real people and companies that buy it are actually satisfied with the product. That’s why we’ve created our behavior-based Customer Satisfaction Algorithm™ that gathers customer reviews, comments and Algolia reviews across a wide range of social media sites. The data is then presented in an easy to digest form showing how many people had positive and negative experience with Algolia. With that information at hand you should be equipped to make an informed buying decision that you won’t regret. What are Algolia pricing details? What integrations are available for Algolia? If you need more information about Algolia or you simply have a question let us know what you need and we’ll forward your request directly to the vendor.